Amazon.com description: Product Description: Itâs the best of the worst: 293 of the funniest cartoons rejected by The New Yorker but luckily for us, now in paperback and available to enjoy. The Rejection Collection brings together some of The New Yorkerâs brightest talentsâRoz Chast, Gahan Wilson, Sam Gross, Jack Zeigler, David Sipress, and moreâand reveals their other side. Their dark side. Their juvenile side. Their sick side. Their naughty side. Their outrageous side. And what a treat. Ventriloquist dummy cartoons. Operating room cartoons. Bring your daughter to work day cartoons (the stripper, the prison guard on death row). Lots of couples in bed, quite a few coffins, wise-cracking animalsâan obsessiveâs plumbing of the weird, the scary, the off-the-wall, and done so without restraint. Every week The New Yorker receives 500 cartoon submissions, and rejects a great majorityâmostly, of course, for not being funny enough. Thereâs no question why these were rejected, and itâs not for lack of laughs. One can almost hear Eustace Tilley sniffing, We are not amused. 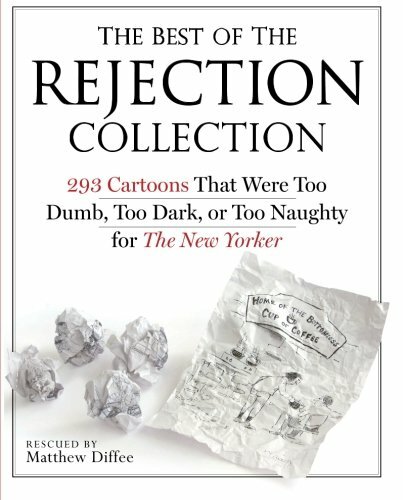 About: It’s the best of the worst: 293 of the funniest cartoons rejected by The New Yorker but luckily for us, now in paperback and available to enjoy.